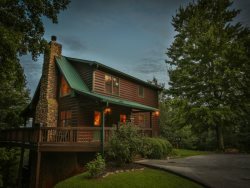 Heaven's Peek sits high on a mountain ridge overlooking the stunning Rich Mountains and the cabin itself is just about as cozy at it gets. With luxurious furnishings and ever changing mountain views, you too may agree that this is "heaven on earth". With all paved access and located in an exclusive North Georgia mountain resort, convenient to downtown Ellijay and just minutes from Blue Ridge, your search for that perfect mountain retreat may be over with this one. With views from most rooms in the cabin, a spacious screened in porch and an open deck, this property gently whispers, "Come, Relax, Enjoy". Listen to the incredible sounds of nature, the gentle breeze blowing through the trees, song birds singing or the distant call of an eagle. Breathe deeply, take in the clean fresh mountain air. Enjoy that 1st cup of morning coffee on the back porch, meditating on the really important things in life. And because you are in a resort community, as our guest you have access to the olympic size swimming pool as well as tennis courts at no extra charge to our guests! Whether you're here to rekindle relationships, spend some much needed time with family or friends or just escaping from the day to day pressures of everyday life, Heaven's Peek will leave you feeling refreshed and thankful to have found this little piece of heaven in the North Georgia Mountains. We loved this cabin. Very clean and comfortable. Beautiful view. We very much enjoyed our stay, to the point of not wanting to leave. We have already discussed returning with other family members. It was a wonderful experience for our family. This property comes HIGHLY RECOMMENDED!! Home, Mountain View and the Serenity! Need I say more? No names in the advertising. The cabin was a delight and near to alot of outdoor activities.A very nice community with great neighbors.Saw lots of deer on the property and a mother bear and 2 cubs walk across our lawn. My 14 yr old granddaughter did't want to leave she loved the cabin that much. Heaven's Peak was AMAZING! The cabin has breathtaking views and all the amenities you would ever need for a getaway in the mountains. I would recommend this place to all my friends and family. Great place and great accommodations. The property was wonderfully stocked, so clean, and so comfortable. Anything and everything we needed was there and the setting was beautiful. We will definitely be back! Beautiful house, beautiful view Everything was wonderful. I highly recommend this house!